SWARM LINE for Nevada County & Yuba County in Northern California. 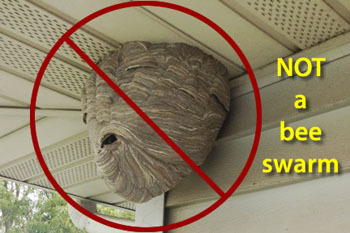 If you discover a Honey-bee swarm resting in your yard or neighborhood, do not be immediately alarmed!! Swarming bees are generally very docile while outside of their normal nesting cavity! We recommend that you just leave them undisturbed and contact us quickly so that a volunteer can come to your location before they move away, capture the bees and relocate them to a new nesting area. 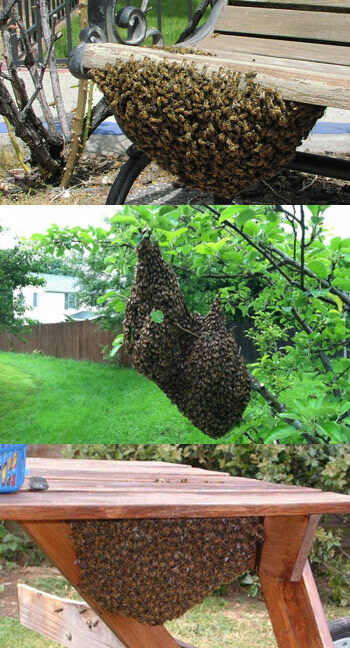 A swarm is a large group of bees that will hang out in a big lump from a tree, the side of your home or other structure while designated bees fly around doing research on the best place to call home. At this point, these bees are very gentle. Swarming is the natural process of the honey bees attempting to reduce the population in an over-crowded hive and to establish a new colony in a different location. Swarming typically occurs in the spring or early summer months and begins when the queen bee leaves the existing crowded hive with approximately half (30,000) of the mature bees of the colony. You could also try your local natural food stores and see who their local honey providers are and contact them.